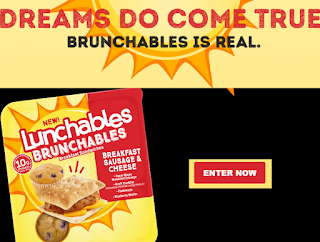 Lunchables Brunchables Giveaway - 100 Winners Win a 6-pack of Lunchables Brunchables and T-Shirt. Limit One Entry, Ends 4/4/19. SHORT 2 DAY GIVEAWAY! PRIZES AND APPROXIMATE RETAIL VALUE (“ARV”): One hundred (100) Grand Prize: Each winner will receive one (1) 6-packof Lunchables Brunchables and one (1) Lunchables branded t-shirt.